December 26, 2009 (YOUNGSVILLE, NC) — If your idea of a mobile home is a flimsy metal trailer with ugly air conditioning units sticking out the windows, think again. 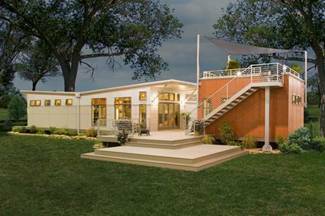 Clayton Homes has introduced a mobile home – or manufactured home, as they’re now called – that is as Modern (with a capital “M”) as it is environmentally friendly, and that has enthusiasts of both sensibilities lining up for tours across the country. On Monday, December 28, George Smart of Triangle Modernist Houses.com (TMH), will host an exclusive preview of the new “I-House” at the Clayton Homes location in Youngsville, NC, starting at 6 p.m. “About 25 people have signed up so far,” says Smart. The Youngsville location is the only store in this part of the state featuring the I-House. From its “butterfly” roofline, abundance of windows, and “flex room” connected by an outdoor living area, to its sleek built-in cabinetry and ultra-modern fixtures and furnishings, the new I-House brings a level of architectural sophistication to the manufactured home industry that has never been seen before. Even more innovative are the I-House’s multiple “green” features that introduce environmental stewardship to the industry. On the exterior, the I-House features solar panels, energy-efficient windows, sustainable/low-maintenance siding and roofing, a rainwater collection system, and decking made of recycled materials. On the interior, the I-House features bamboo floors, tankless (or on-demand) water heaters, dual flush toilets, low-flow faucets, Energy Star appliances and no V.O.C. (volatile organic compounds) paints for indoor air quality. The tour is free but participants are asked to contact Smart in advance to get on the list. 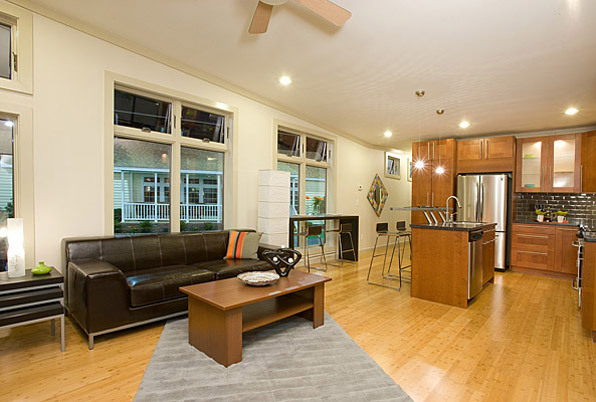 Contact Smart at george@trianglemodernisthouses.com. For more information on the I-House, visit www.claytonihouse.com.